Home…that word conjures up so many wonderful thoughts: family time, meals, cozy spaces to read books or watch TV, a warm bed with cozy blankets on a cold night. The list could go on and on. While home is such a wonderful place and idea, taking care of a home can be anything but wonderful, especially if you’re the type of person who gets bogged down in details. There’s food shopping and preparation to be done, a slew of cleaning tasks that need to be done daily, weekly, monthly, quarterly and yearly, medical appointments have to be made and medications organized and a budget to be organized each and every month. It’s enough to make anyone’s head spin! That’s why using a Household Planner is the best way to get your home tasks organized so that you can stay on top of everything that needs to be done, plus keep from going insane trying to remember everything! 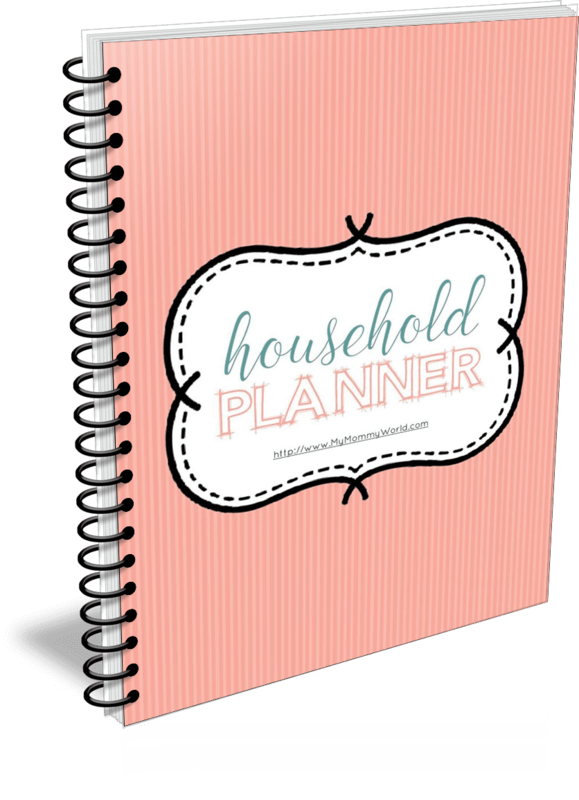 With the 27 pages included in this printable household planner, you can plan your meals, track your budget, organize your family’s medical needs, keep track of home or car maintenance, and plan your grocery shopping and house cleaning. Does running a household stress you out? I always thought that running a household would be easy as pie. Both my mom and grandmother made cooking and cleaning look easy…their houses were always clean as a whistle, and the food that they prepared was always delicious! But as I grew up, married and began having children, I started to realize that taking care of a household was actually a pretty big job. With so many moving parts and things to think about and plan for each day and month, I started having trouble remembering it all…especially when the kids came along. That’s why the My Mommy Household Planner is such a great tool. 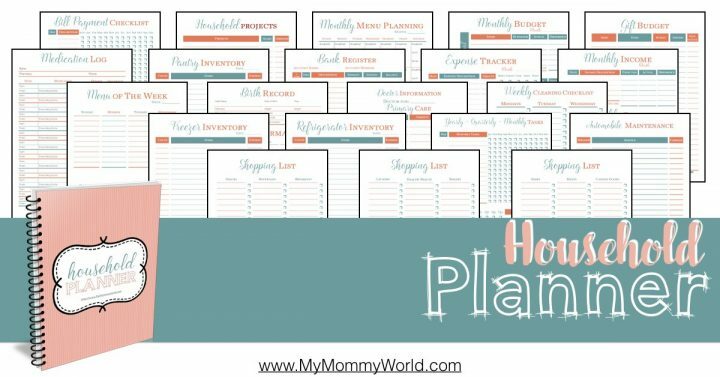 What is included in the My Mommy Household Planner? Individual pages can also be printed out each week (i.e., the weekly menu planner or shopping lists) and used over and over again to get you through the year. 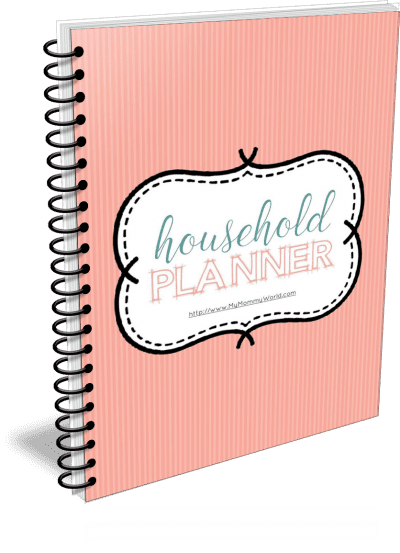 This household planner can also be used year after year…it isn’t marked with a particular year, which forces you to buy a new planner each January. Print as many copies as you need for personal use! Get your household details organized once and for all, and watch your life get easier as you get your meals, cleaning chores and budget in order month after month! 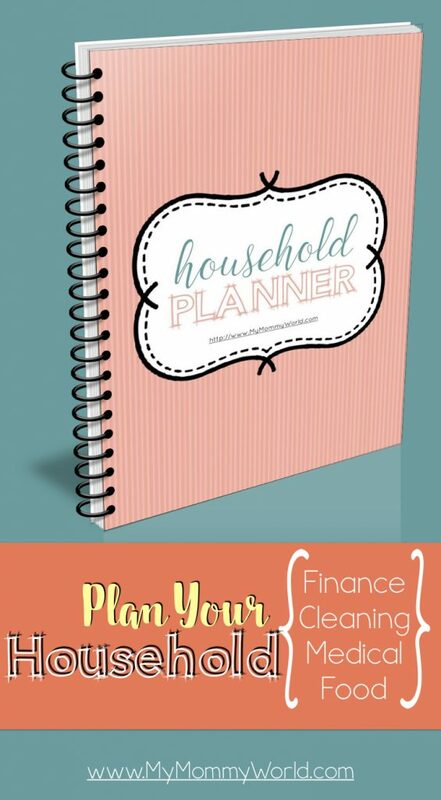 A 27-page planner to help you organize and manage your entire household. Contains budget/finance worksheets, maintenance/cleaning planners, health and medical forms, and menu planning and food storage worksheets to help you stay organized while running your household. I hope the My Mommy Household Planner will help you create a peaceful and organized home that is much less stressful and more enjoyable for yourself and your family. Perhaps it will help make this year the best yet! I love using a household planner. It really does help to keep our home running smooth and I don’t have to keep it all in my brain. After it’s written down in my planner I don’t have to think about it and remember it.